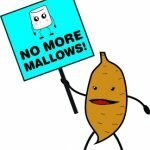 This is my recipe for the 2012 NC Sweet Potato “No More ‘Mallows” Blogger Recipe Contest! Every year I try to create a sweet potato recipe that will WOW my friends and the NC Sweet Potato Commission. This could be it! It all started with picking basil for pesto this morning and thinking about a sweet potato sformato seasoned with basil and garlic. The pesto actually provided all the seasoning needed to enrich the sweet potatoes. My neighbors tasted the resulting dish and all I heard was yums so lets hope the rest of my fans think so too. My bumper crop of cherry tomatoes provided the topping and gave it a lovely fresh tweak. This is a super easy recipe so I hope you’ll give this a try and tell me what you think. To make basil pesto: rinse 2 cups of fresh basil in cold water and towel dry. Add basil to a food processor with 2 cloves of garlic, 1/4 cup grated parmigiano cheese and 1 tsp salt. (Nuts, 1/4 cup of roasted pinenuts, almonds or walnuts is optional). Pulse to chop fine and add 1/2 cup olive oil and process until well combined…do not over process. You want a bit of texture. Refrigerate or freeze leftovers. To roast cherry tomatoes: wash and slice tomatoes in half and place in a bowl. Drizzle 2 Tbsp olive oil over tomatoes and add 1 heaping tsp sea salt, freshly ground black pepper to taste and 1 tsp finely minced garlic (1 clove). Toss until the tomatoes are covered. Place on a baking sheet and roast in 375° F. oven for 25-30 minutes. Remove from pan and cool slightly. Cover with olive oil and refrigerate up to 2 weeks or freeze leftovers for pasta, bruschetta or pizza. Butter 6 ramekins and sprinkle with Italian bread crumbs. Place in the freezer until ready to fill. Drain the boiled sweet potatoes and return to the pot to dry out a bit. Mash potatoes with the butter, brown sugar and pesto. Whisk the eggs and milk together and add a pinch of nutmeg. Stir into the seasoned sweet potatoes. Remove ramekins from freezer and fill. Bake in 350° F. oven for 20-30 minutes or until knife tests clean. Run a knife around sides of ramekins and invert onto a platter or individual plates. Top with roasted cherry tomatoes and chopped basil or parsley. Three for lunch and this is all that’s left of my crazy Peruvian Potato Casserole…really delicious. 2012 may be the year of the Dragon but it’s also the year of the Potato. This year is a double whammy for Peruvian food because Peruvian cuisine is not only all about the potato but its also on the list of culinary trends predicted for this year. This dish is a hot version of a Peruvian causa which is filled layers of seasoned mashed potato. This hot version is topped with a very simple cheese souffle, more like a meringue than a souffle. Its cooking 101 here so don’t be intimidated with those French terms: souffle and meringue…they’re no big deal. This dish is real comfort food for the winter months and easy to make for a crowd. I’ve used a pork picadillo and cheddar cheese for my filling but spinach and chicken with feta would be awesome and any sauteed veggie medley would work as a vegetarian alternative. There’s no butter, sour cream or bacon to raise the calories of the potato so it’s nearly quilt free eating. Give this a try next time you’re hungry for mashed potatoes. Arepas are a gift from Venezuela and Columbia. However, they are found throughout the Latin countries and the Caribbean. They are made of precooked cornmeal, either white or yellow with very fine granules, sometimes called Harina de Maiz, not to be confused with Masa Harina which is used for tortillas. Arepa flour, Instant Precooked Cornmeal, is available in Latin and Caribbean markets. P.A.N. and Goya are two common brands. If you can’t find Instant Cornmeal, look for Instant Polenta in the Italian isle of major supermarkets. This is one of those recipes my Mom made frequently. We often had quasado with tomato soup on cold wintery days or with chicken soup at night. Mom always served this as a nibble at card parties and she was lucky to have any left for the family…everyone loved this dish. Quasado, pronounced kwah-shah-doh, is a Sephardic Jewish dish of spinach, feta cheese, garlic, onion, parmesan cheese and lots of dill. Make it in a pie plate, or muffin cups for easy to wrap and pack in lunchboxes. The flavors are Mediterranean with a moist spongy center topped with crunchy browned parmesan cheese. The same recipe can be made for appetizers by simply spreading the mixture over a 7X11 inch rectangular pan lined with parchment paper. Bake as directed below and cut into fingers or squares. Roasted Chicken from a roadside vendor is one of the true delights of living in Puerto Rico. There is so much love put in these tender, juicy birds roasted on the spit. The local rub used is made with Sazon (available in spice isles of better supermarkets or Latin markets), a close relative of adobo. You literally can smell these delicious birds roasting from a block down the road and start salivating while pulling over to the truck. I couldn’t buy and roast a bird as cheaply as I can buy one of these roadside babies. This recipe was inspired by The Neeleys at Foodnetwork. I’ve tweaked the recipe with celery and green bell pepper since both go so well with tomatoes. By all means, add chile or red pepper flakes for a kick and herbs such as fresh oregano or dill. Serve it as a side dish or on its own over rice. This is simple, quick and easy cooking when you don’t want a heavy meal or don’t feel like spending a lot of time in the kitchen. Potatoes are common fair throughout the Latin countries. This recipe is inspired by the Peruvian causa relleña, filled layers of seasoned mashed potatoes. I’ve added a Puerto Rican sofrito with lots of cilantro to the potatoes, sauteed in a little annato oil, plus some crumbled crispy bacon. This is similar to a Puerto Rican mofongo which is usually made with yucca (cassava) and chicharones (crispy fried pork rinds). 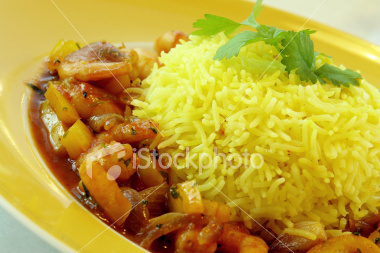 The mofongo lines a bowl and is filled with savory sauteed shrimp, chicken or other meat. Causa layers are more often filled with chicken, octopus or crab salad. Here I’ve used avocado slices dressed with a citrus vinaigrette. The topping is a salad of roasted red peppers with fresh oregano, capers and citrus vinaigrette plus a 4-minute boiled egg. Minus the egg and bacon, this is a tasty vegetarian dish and certainly an alternative to those mayonnaise laden potato salads. Serve this as a side dish with grilled snapper or your favorite steak. Its a great salad-main served with a cold crab gazpacho or a lobster bisque. Mini sized causas made with purple or blue potatoes make elegant appetizers. Rather than individual causas you can make this family-sized and cut it into serving wedges. Bananas are not just for monkeys or desserts. Since they take a good amount of time to ripen on the stalk from a starchy green to the more commonly recognized yellow fruit, its not too surprising that a lot of tropical cultures enjoy them in the green stage as a potato substitute. Green bananas boil to fork-tender in about 15 to 20 minutes and they are a great canvas for infusing piquant and savory flavors. Cinco de Mayo (May 5th) is just around the corner so this recipe is timely, delicious and a cut above the usual fresh salsas. Napale cactus paddles are harvested from April to August when they are young and tender yet thin and firm. Most mercados or markets state-side now sell napales without the spines, ready to grill or boil. 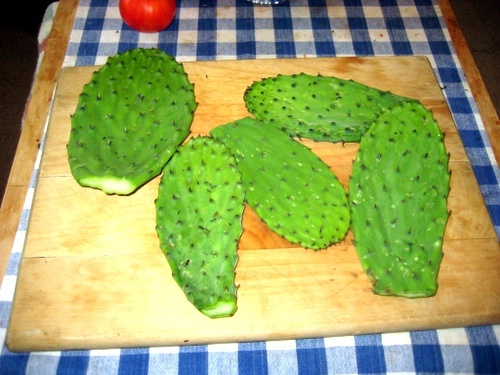 They are also very cheap and contain vitamin A and C. Think of Napale cactus as a green vegetable with green bean flavor. It’s important to scrub each paddle before cooking with a brush and remove any node where new thorns are developing. Slice the paddles from top to bottom about 1/2 inch wide and dice to 1/2 inch. Place in cold water and bring to a boil for 5-6 minutes, drain and repeat the boil until the napalitos are fork tender. This will remove the slimey liquid ( called babas) similar to aloe vera juice. Napalitos can be refrigerated for up to 3 days and are best added to soups, stews, burritos, salads, salsa and scrambled eggs with chorizo. Combine all ingredients in a bowl, cover and refrigerate for 2 hours or longer so flavors will blend. Serve with tortilla chips, nachos, burritos, or as a condiment with meat dishes. Substitute sunflower seeds, pine nuts, or almonds for pumpkin seeds. Use northern beans, kidney beans, or pinto beans instead of black beans or a combination of beans works well also. This Indonesian recipe is from my Sumatran friend living in Australia. The first time I tasted this I fell in love. It is so light with just a whisper of lemon and coconut to tease your taste buds. I’ve since made it my own and friends always ooh and ah. Use your rice cooker for best results. The lemon grass, fresh turmeric root, fresh coconut, and kaffir lime leaves can be found at Asian markets and some supermarkets. The lemon grass leaves can be steeped in boiling water for a refreshing cup of tea. Fresh turmeric stains everything so take care when handling this root. Break coconut, shred meat, soak in 3 cups warm water, place in a fine sieve , and push solids to extract milk. You need 1 cup of coconut milk. Use the remaining coconut milk in another recipe (see below). Crush fresh turmeric in a blender with 1/4 cup water, place in a fine sieve and push solids to extract juice. You want 2 Tbsp of the extract. Place everything in your rice cooker, give it a stir and push the switch to cook. When finished cooking, remove lemon grass bulb, bay leaf and kaffir lime leaf. Fluff with a fork. Serve with your favorite curry dish, chicken, fish, or Thai dish. Use leftover coconut milk in curries, baked chicken, mix with shaved watermelon for a fruit dessert, add it to your favorite ceviche, cook octopus with it, cook green bananas or plantains in coconut milk for a starch dish, cook ripe bananas with coconut and honey for a hot drink like the Tongans do. Dry the grated coconut and toast it for cakes.